Race day is getting closer and closer. That means a certain someone checks weather.com multiple times a day. Yes, that would be me. I’m hoping that this little picture next to Saturday magically turns into a cloud, or even better, a sun! Anyone else obsessed with checking the weather? I know that at the very least, my sister is – I guess it runs in the family! For a short period of my life, I actually wanted to be a meteorologist. Or a tornado chaser – I thought that would be the coolest job ever! I still think it would be pretty cool. But in the meantime, if you ever want to know the weather forecast, I’m your girl. Enough worrying about the weather! How about I share my new favorite hummus recipe instead? Sun-Dried Tomato Hummus! I don’t know why I’ve taken so long to make this fabulous combination. I love sun-dried tomatoes. I can eat them right out of the jar. One day soon, I will make my own. 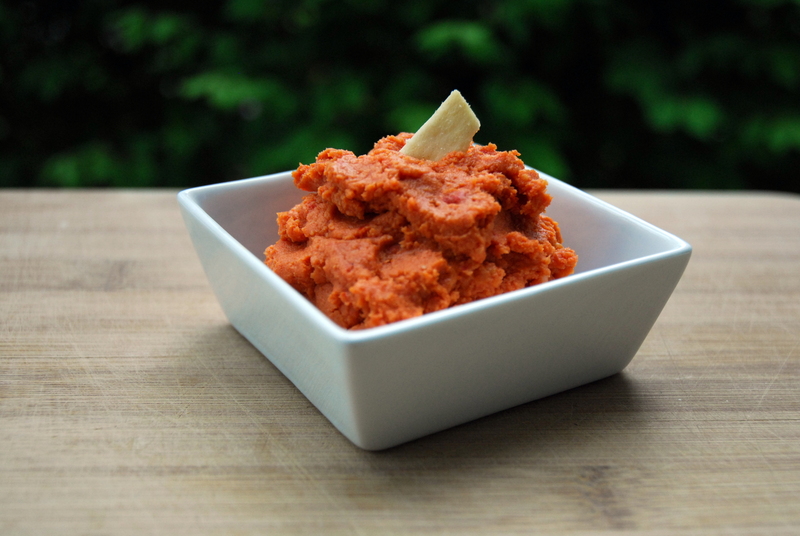 This is by far the best hummus I’ve made – so full of delicious flavors! And it’s as easy as 1 2 3! 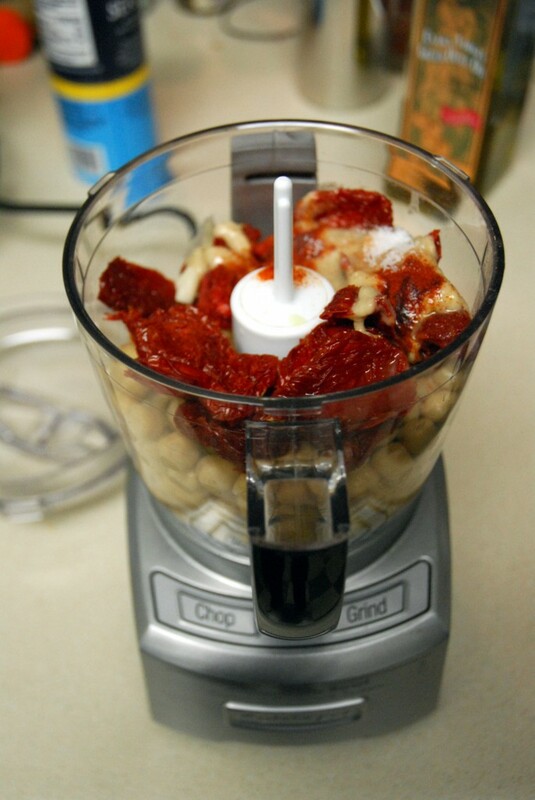 1 – Put all the ingredients in a food processor. 4 tbsp olive oil *Note – My sun-dried tomatoes were not packed in olive oil. 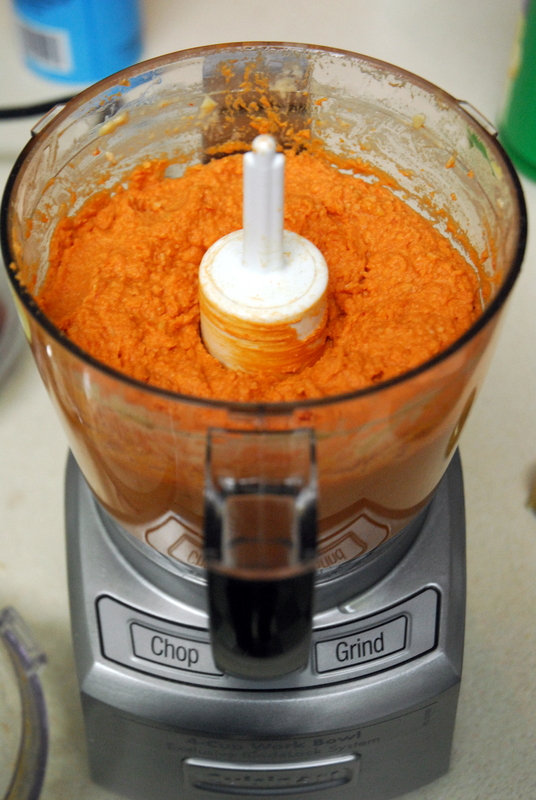 Put the all of the ingredients in a food processor and pulse until smooth. 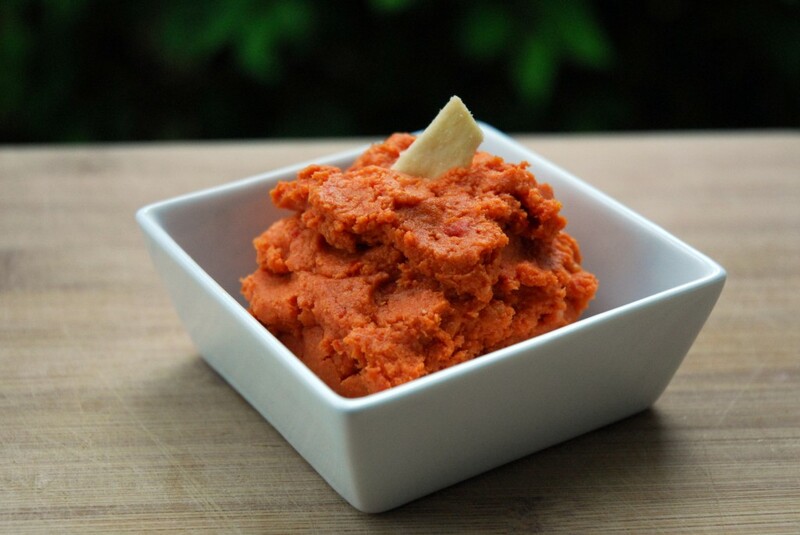 *If you have a smaller food processor, I’d suggest first adding the garlic, sun-dried tomatoes, tahini, lemon juice, salt, paprika and olive oil pulsing until well combined, and then adding the garbanzo beans little by little and pulsing until smooth. 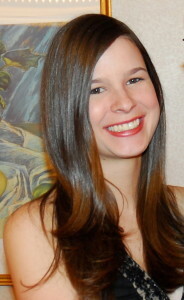 This entry was posted in chickpeas, Gluten-free, Recipes, Snacks, Vegetarian and tagged gluten-free, hummus, recipes, Snacks, vegetarian. Bookmark the permalink. I have only made hummus once and for some reason, it didn’t turn out very good. Fingers crossed for a sunny but cool race morning! This was wonderful! Thanks. I had been looking for something easy to do with my left over package of sundried tomatoes. This will be a staple.